Here are Telecare Choice, we realise how important it is to get a Telecare Alarm installed, set-up and running in your home. That's we offer free 24-hour delivery on all of our alarms, and on our Telecare Accessories. Our service is available throughout the UK so ensure that we can help as many people as possible. What's include in the Telecare package? 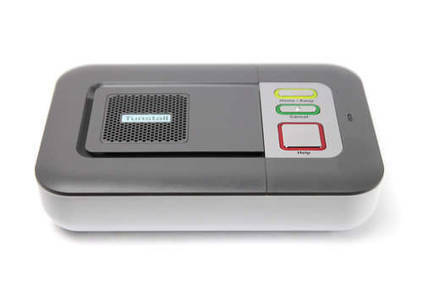 Powerful speaker/microphone so that even those who are hard of hearing can communicate with the monitoring centre. The alarm will continue to function in a power cut for up to 40 hours on a battery backup, meaning that the user is still protected even when the power goes down. The small, discreet alarm unit will subtly fit in nicely with your existing decor. Despite its name, the pendant can be worn multiple ways including on a wrist strap, on a neck cord or on a belt clip. The MyAmie pendant fits in with the user's life and can be worn at all times. 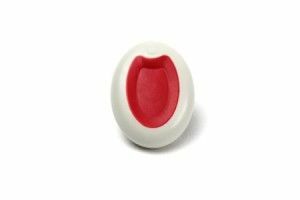 The button itself is concave so that users do not have to worry about accidental alarm calls. The bathroom can be more hazardous for those with mobility issues. That's why the MyAmie Pendant is waterproof so it can even be worn in the shower. The Telecare Pendant has a battery life of up to seven years. When it starts to run low, a free replacement will be sent. Telecare Choice offer two simple price plans to ensure that you can get your personal alarm up and running as soon as possible. Of course, both of our price plans come with free 24-hour delivery so that you can have your new alarm installed sooner, rather than later. Once installed you will be covered by our 24-hour monitoring team. Should you need help, day or night, simply push your Telecare pendant and a member of the team will respond within seconds. He or she will then take appropriate action, whether this is contacting a relative or the emergency services. Ensure help can gain access to the property with a Keysafe. Want to find out more about our Telecare Alarms? Request an info pack and we will send it out via post or email within 24 hours. Give our friendly customer services team a call or send them an email. Visit our Frequently Asked Questions page to read more.